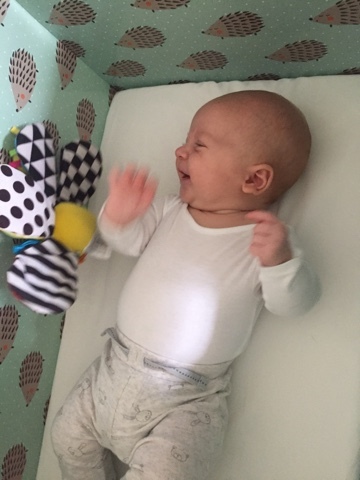 In the beginning Oskar was drawn to light and dark, black and white, so we spent time looking at black and white toys, we made him a light box and bought him a star projector that he would happily watch for a while. We read him books that had big white pages and black writing with simple illustrations and we made shadow puppets on the wall for him which fascinated and enthralled him. As he got bigger and stronger he started to understand that he could participate in our games and began to hit and touch and grasp his toys. And then began to want to taste them too, so began the everything in to his mouth phase. 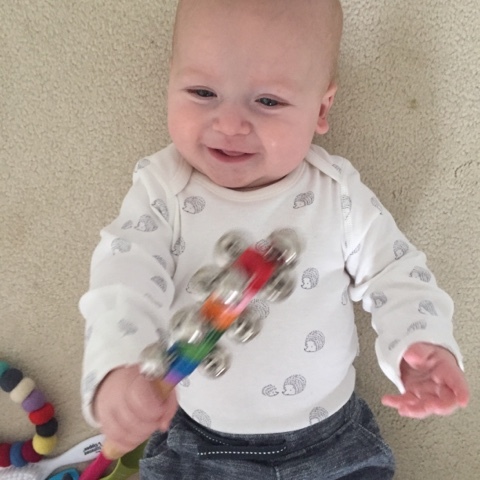 Like most curious five month old babies, Oskar has suddenly started to take an interest in the world around him. He wants to grasp everything in sight, he wants to feel it, sense it, and put it in his mouth to taste it. He is starting to understand the concept of distance, of things going under, over and behind other things. He is beginning to make connections between the action and the consequence, like the shaking of a rattle or banging of a spoon on a table. With this in mind I have spent the past week or so developing a treasure basket for Oskar, for him to explore while we play. 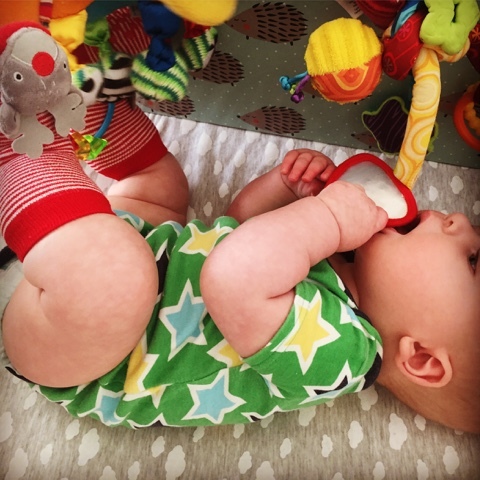 The idea behind a treasure basket is that at their own pace, babies can explore a variety of textures, shapes and colours, as well as the noise and taste of various objects. 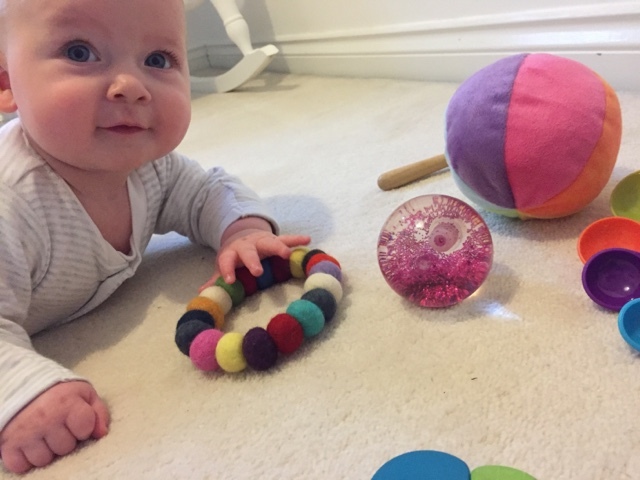 It stems from the Montessori style of play, something we are both very interested in. The great thing about a treasure basket is that the things it contains are not expensive or difficult to find. 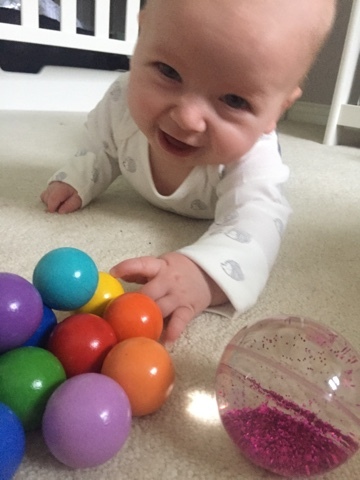 Most people use everyday objects from around the home, we chose to add in some other objects that we knew Oskar would enjoy exploring, sourced from simple high street shops and online. Within it are some bells which Oskar loves to play with and often reaches for first, a baby hairbrush with a solid plastic handle and soft bristles, a jelly ball filled with amazing pink glitter which sparkles as you roll it, great for showing him perception of distance - he likes to watch it roll away and then gets very excited when it rolls back again! 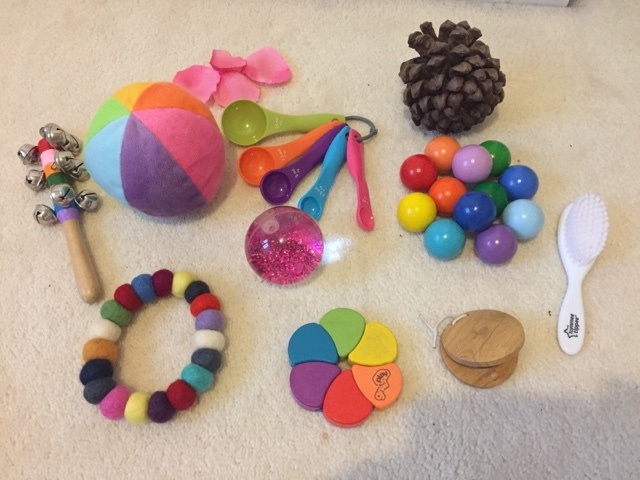 There are a few wooden grasping toys of various shapes and colours, good for tactile exploration and understanding the idea of passing an object between two hands. There are some measuring spoons which he loves to bang on surfaces and a pine cone which is a completely different texture all of its own. And finally some fabric rose petals, which we throw up in the air and watch as they come floating down over our heads. 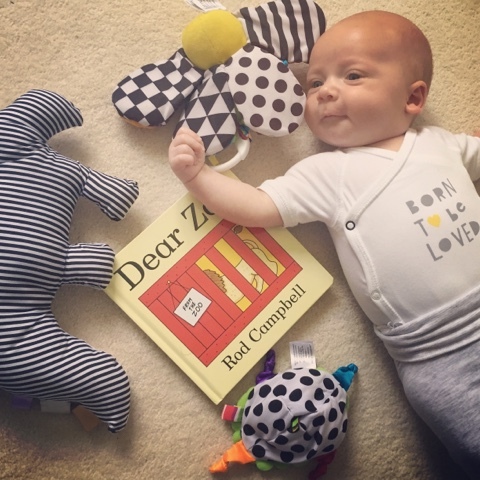 The great thing about treasure baskets is that the items can be easily swapped out for another as your child grows and learns and understands more about the world around him. With Christmas approaching we plan to swap out some of the items for more Christmas themed ones such as tinsel and a shiny bauble! But for now, Oskar certainly seems to be enjoying his basket of treasure! Adorable photos ladies. He is growing so much.